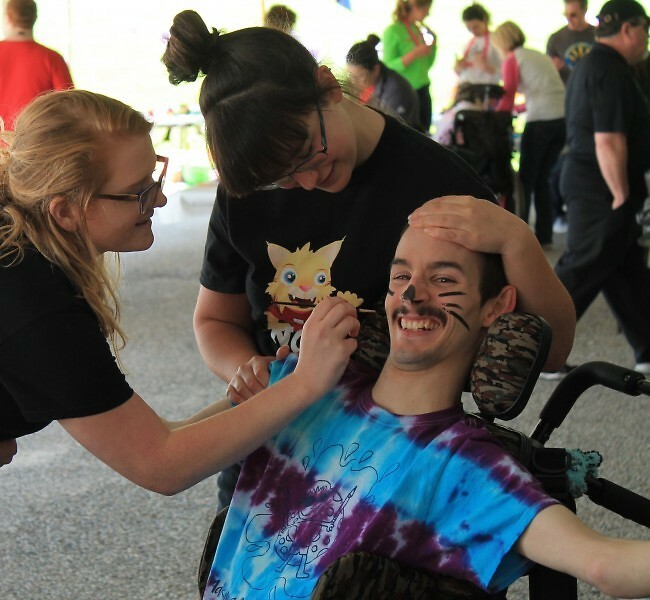 Earlier this month, more than 1,000 students joined Artists Creating Together at Lincoln Campus to celebrate arts, abilities, and community. Festival Day began in 1986 in Grand Rapids, MI as a celebration of arts and abilities for Grand Rapids special education classrooms. Today, Festival Day is a highlight for many students, teachers, and volunteers. ACT welcomes over 1,000 people each year on this special day celebrating all arts and all abilities. Festival Day gives students a chance to share their inner world and make connections with the world around them – providing opportunities for growth, confidence-building, and self-expression. 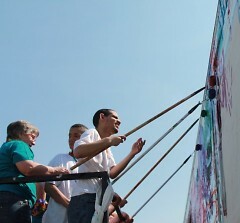 Nearly 100 classrooms come to Lincoln Campus to experience a series of hands-on art workshops in a variety of art forms as well as a sensory ‘arts arcades’ and other performances, including an opening ceremony. ACT coordinates nearly 25 teaching artists to host workshops and activities throughout the day for students that have a variety of abilities. Hundreds of kids, teachers, parents and volunteers are crowding around a center stage, upbeat music booming from the speakers. Pharrell Williams’ “Happy” plays and several kids instantly jump up, turning to dance with their chaperones, teachers, and classmates. A local news station is at the front of the room, explaining the high levels of excitement. Everyone is smiling when music duo Channing and Quinn take center stage and officially start the opening ceremony, although the fun began long before this. This exciting day is important for the Grand Rapids community, but not in the traditional way. 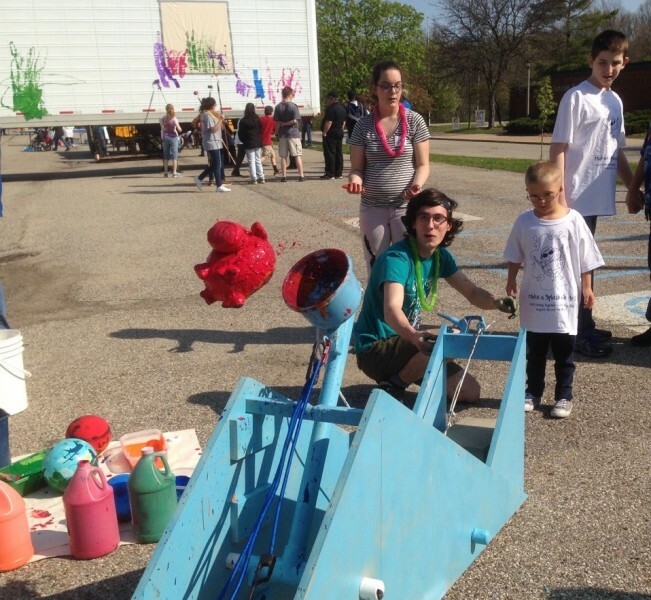 It’s Artists Creating Together’s Festival Day — a day dedicated to bringing more than 1,000 special education students together for a celebration of art, community and abilities. 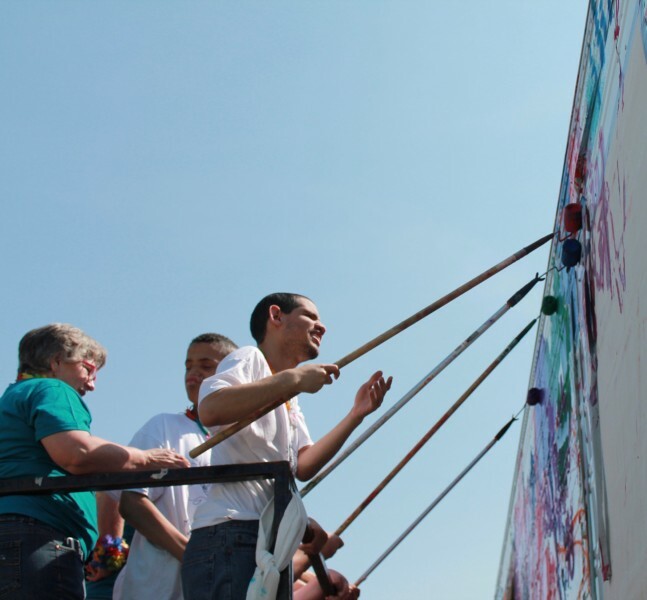 This particular Festival Day was the 30th annual event, with the theme Makin’ a Splash with Art! Since 1986, Festival Day has been bringing inclusion to the Grand Rapids community and this milestone event was nothing short of spectacular. Central to Festival Day are the wide range of programs: coloring stations, music, painting, drawing, hip-hop, ballet, 3-D projects, theater and so much more. Each program is unique, hosted by professional teaching artists and supported by volunteers so that all students have the opportunity to explore creative outlets that fit their individual abilities. These students are provided with the all resources needed so they can focus on just having fun and celebrating their work. ACT also provided all students with unique white Festival Day T-shirts, designed by classrooms involved in Festival Day, truly celebrating their art. Students were able to decorate their shirts through coloring and customizing, so students immediately had the opportunity to be independent artists. This is ultimately the goal of Festival Day: to promote independence, celebration and empowerment in growth. But this event is not just for special education classrooms and ACT artists and volunteers. One of the most unique aspects of Festival Day is that it brings together people from all over Kent County. Festival Day provides a unique outlet for Grand Rapids youth to get involved in the community. Many volunteers were other kids from Grand Rapids schools, dedicating their time to providing a fun and creative outlet for other members of the community. These kids have the opportunity to learn more about inclusion efforts and the unique abilities we all have. One ACT teacher from the Grand Rapids improv group “No Outlet” was particularly impressed with the way Festival Day caters to different groups. Eirann Betka is an improv actor, teacher at the Grand Rapids Civic Theater and a developer and producer of shows. Betka has volunteered at Festival Day for two years now, bringing something new to Festival Day each year. This year, “No Outlet” ran a comedy and theater improv workshop — an instant hit for students and volunteers. Several students were drawn to the workshop, laughing with the show and joining the actors. Considering how much improv relies on individuality, many students stepped out of their comfort zones for the workshop — a breakthrough many teachers and volunteers noticed. At the end of the day, there was an undeniable closeness at Festival Day. Everyone was laughing and having fun with each other. Students, teachers, volunteers, and artists of all abilities were working together, helping each other, and praising one another. There were no barriers — just inclusion, diversity and bringing a community together. This is ultimately the goal of Festival Day and the event continues to grow with Grand Rapids.